While exploring London, stop by The Florence Nightingale Museum to see the strong-willed nurse’s European legacy. Florence Nightingale was an audacious, strong-willed, young woman who revolutionized nursing and hospital care across 17th century Europe. Pioneering nursing at Scutari Hospital, a British base during the Crimean War, she and her skilled team of nurses lowered the death rate by two-thirds! Saving thousands of young soldiers’ lives, Florence used her skilled hands and expertise to improve the horrid, unsanitary conditions throughout Europe. She completely revolutionized European healthcare and became the guiding force behind death rate reduction from infectious disease. Spending all waking hours caring for the wounded soldiers of Crimea, she was often seen hard at work pacing through the hospital with a night lamp in hand. Gaining world-renown for her efforts, she quickly became recognized as, “the lady with the lamp.” Passionate, driven, and determined to lend a helping hand to those in need, Florence Nightingale’s legacy lives on today as sanitation remains a crucial priority in hospital care across the world. 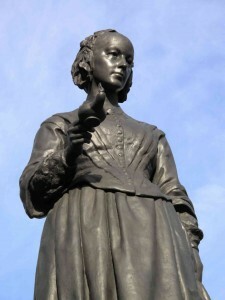 Explore London to see learn more about her life and nursing legacy at the Florence Nightingale Museum! Born on May 12, 1820, in Florence, Italy, Nightingale came from a family of affluent British elites. Her mother spent much of her time socializing with people of the prominent upper class, and her father was a wealthy landowner who inherited two valuable estates. From a young age, Florence spent much of her time helping the sick, using her nurturing hands to help the poor in a village that neighbored her father’s estate. The skills she began to cultivate in her youth would serve her well in her future endeavors where she was presented with major healthcare challenges. Florence Nightingale’s most notable accomplishment was the much-needed aid she gave to suffering British soldiers during the Crimean War. The Crimean War was a struggle for the Ottoman Empire between the British Army and the Russian Empire. During a period in Europe when cholera outbreaks and unsanitary conditions contributed to the rapid spread of disease was evident in every hospital, the western world was past due for much-needed health care reform. In 1854, Nightingale received a letter from the Secretary of War, Sidney Herbert, desperately pleading for her help. She needed Florence to assemble a team of her best nurses to tend to the sick and fallen soldiers of Crimea at the main British base, Scutari Hospital. Florence had no idea how awful the conditions were until she arrived. With wounded soldiers resting on soiled sheets, bugs and rats weaving between nurses’ legs, stretchers strewn throughout the hallways, and a scarcity of necessary supplies Florence Nightingale was the spark in the night these suffering men had been desperately pleading for. She quickly set her team to work scrubbing the floors, changing bed sheets, and promoting the organization and cohesive care that saved thousands of soldiers lives! She lowered the death rate significantly and was famously recognized for her self-sacrificing efforts. The British Queen later rewarded Florence with an engraved brooch and $250,000 for her war efforts. She used the money to further her cause, opening the Nightingale Training School for Nurses. Florence’s legacy inspired many young women to further their careers in nursing, and a vast majority aspired to be like her. Her school made it possible for lower-class women to gain a solid footing in a society that had given up on female nurses. Her legacy lives on today in London, England! Stop By The Florence Nightingale Museum While Exploring London! A small museum in the heart of London, learn more about the lady with the lamp and her skilled, careful hands at the Florence Nightingale Museum. Travel through three pavilions which take you through the life and times of a driven, young women with the desire and passion for making a difference. Gaze upon her accomplishments in awe as you reflect on how difficult it must have been for a woman, in 17th century Europe, to rise to such a respected position during a period of profound sexism toward female nurses. Find a source of inspiration for your own life as you take a look at her Victorian childhood, passion-driven career, and her years following as a successful campaigner. See her accomplishments with your own eyes when you travel with AESU to London next summer. Explore London On Your Next Eurotrip! This entry was posted on Wednesday, July 20th, 2016	at 11:04 am	. You can follow any responses to this entry through the RSS 2.0	feed. Both comments and pings are currently closed.